It’s no April Fools Joke. Country music legend Loretta Lynn is gearing up to celebrate her 87th birthday this April 14th, and on April 1st, many of country music’s finest will be coming together to show tribute to the Coal Miners Daughter in a massive concert and birthday party at Nashville’s Bridgestone Arena. This was the announcement coming out of a press conference from the Grand Ole Opry House in Nashville Monday (1/14), where Loretta Lynn made a rare public appearance after suffering a stroke and a fall recently. Garth Brooks also helped announce the tribute, and will perform on April 1st along with Alan Jackson, Brandy Clark, George Strait, Jack White, Kacey Musgraves, Little Big Town, Margo Price, Miranda Lambert, Martina McBride, Pistol Annies, Trisha Yearwood, Keith Urban, Darius Rucker, and many more to be announced as artists wanting to show their appreciation for Loretta line up to play. When asked at the press conference how she was feeling, Loretta Lynn responded, “I feel great. I feel great!” while appearing to be in good spirits (see video of the press conference below). The country music Hall of Famer suffered a mild stroke on May 5th, 2017. While recovering, Loretta Lynn began making public appearances again, including at the Country Music Hall of Fame induction ceremony for Alan Jackson on October 22nd, 2017. But then on January 8th, 2018, Loretta suffered another health setback after falling and fracturing her hip. Loretta canceled her only tour date in 2018, and has since been mostly out of the public spotlight. 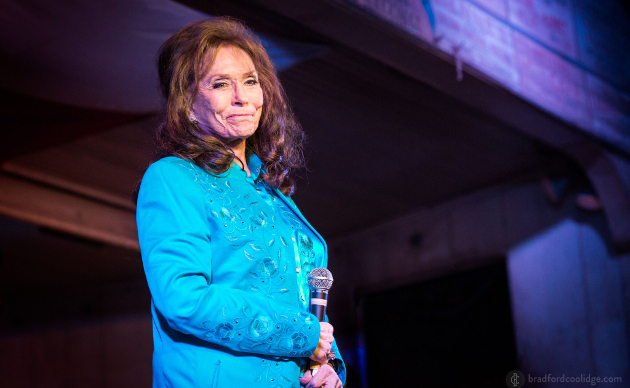 When asked if she would be performing any duets with the assembled performers at the upcoming birthday tribute, Loretta Lynn answered, “No, I come to listen,” which leaves it uncertain if Loretta will perform at all, at the tribute, or in the foreseeable future. Loretta has no tour dates or other appearances booked at the moment. Of course Loretta Lynn has contributed more than her fair share to the legacy of country music whether she ever sings another note publicly. But devoted Loretta fans hold out hope that she will be able to perform once again. Loretta Lynn released her most recent album Wouldn’t It Be Great on September 28th, 2018. It comes from upwards of 90 songs that Lynn recorded at the Cash Cabin Studio over the previous years in preparation of regular releases from Sony Legacy Recordings. Is this going to be televised??! There is no information so far on it being either televised live or taped for later broadcast. If that materializes I’ll try to let folks know. I wish it would, but it’s doubtful. In the past years we’ve had tributes like this at Bridgestone for George Jones, Merle Haggard, Randy Travis and most recently Willie Nelson, none of which were recorded for broadcast. The best we can probably hope for would be someone cell phone videos from the show popping up on YouTube. The Willie Nelson one was recorded, and is going to be aired on A&E later this year. Blackbird Presents I believe has taped most of their tributes with the idea of releasing DVDs, but most of them have not materialized. Jack her son lived with me and my husband when he was going to horse shoe college. I heard alot of stories about her, and my self she is one in a million and her son Jack worshiped the ground she walked on. My favorite in all music singers…. It’s a thing… I don’t think that’s the right term for it, but my brother is a professional farrier, and he had to go to school for it. Loretta and and talk to her for just a minute . The woman is 87 years old. The idea that she should be performing–or writing–is ridiculous. favorite singer.That’s what makes Country fans special,they are loyal,no matter the singer’s age. Yes,I hold out hope that she will perform again,and I make no apology for saying or doing that.Loretta has a beautiful voice,and I love to hear her sing.Just my opinion. Loretta is the best country singer in the world. Everyone still must remember that she is from Kentucky where the best comes from. Loretta all of us from Kentucky wish you a very very Happy 87th Birthday 🎂 Kentucky Loves Loretta. I agree Robert.I’m from Kentucky,and I Love Loretta too! For me, Hank edges out Loretta for the top spot, but by the skin of his teeth. LORETTA, YOU HAVE ALWAYS BEEN AND ALWAYS WILL BE MY FAVORITE COUNTRY MUSIC SINGER!!! I LOVE EVERYTHING AND EVERYBODY YOU SING WITH!!! HAPPY BIRTHDAY LORETTA!!!! I’m so excited for my Favorite, Country Female Singer Loretta Lynn in April! For her birthday with her Music Friends! Dear Loretta you have no idea how a a 56 year old man loves and has loved you since I can remember,you are at the heart and soul of my being and God truly blessed us all with you and your music may he keep safe in his loving arms alway and forever. Happy bday loretta. Love love you. Can’t wait to see the show in april..